An artistic planner with a winged hat. A man with a plan, moves cautiously into every situation. 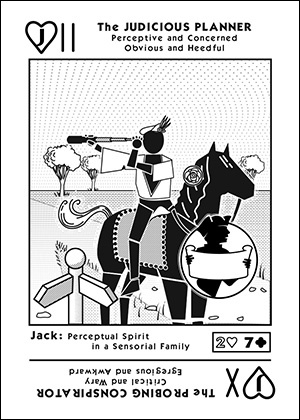 A Perceptual Spirit in a Sensorial Family. Judicious, because, like the 2 of [X] he looks at both sides. He looks for harmony. Designer, because, like the 7 of [--] reversed he is heedful in his approach. Observant, because, like the 2 of [X] he does not miss the obvious. Heedful, because, like the 7 of [--] reversed he proceeds with caution, lingers and savors every moment. He lets moments happen on their own time.